Garlic and Sapphires : The Secret Life of a Critic in Disguise is not a book that I can say I would have picked up in my own right. I read it along with my in-town book club this past month. This book proves what they say about the importance of a book club in that you read books that you might not otherwise pick up. I'm very glad to have had this title placed into my hands. It was tons of fun. 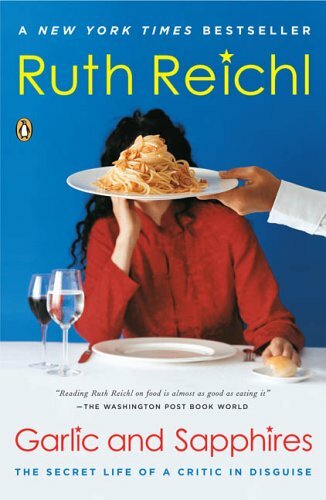 Ruth Reichl has served as a food critic for both the LA Times and the New York Times. She went on from there to work as Editor in Chief at Gourmet Magazine and has a smattering of cooking shows and television appearances on her resume as well. I think it's safe to say that she's made her way nicely around the world of food. I like food. I like food a lot. I had never tried reading about it before so this was a new experience. If given the choice between eating food, or reading about it, I think I would just as soon eat it. However, there are fewer calories in a book which is its own appeal. Reichl was not initially well-received in New York due to the fact that she deviated from the norm of highlighting and reviewing French restaurants. She liked all sorts of food (and happily all sorts of food like her) and featured different ethnic restaurants, not just French. By golly, she was daring enough to even feature area steak houses! This was previously unheard of for a Times' food critic! She also suffered some difficulties in being accepted for the simple fact that people knew that she was moving to NY from LA. Although she was born and raised in New York, coming back as an adult to make a name for herself in her chosen field proved difficult. People didn't always catch on to the fact that she was a native and, as anyone from any town can attest (if they are being honest), outsiders are looked at with some degree of suspicion. In order to do her job and do it well, Reichl had to try hard not to focus on the nay sayers but give her best effort in writing up honest reviews about the restaurants she chose to visit. Garlic and Sapphires makes for a quick, entertaining read at roughly 352 pages. I read it in two easy sessions and enjoyed myself immensely. I'll never doubt the fun of reading about food again, although she made me quite hungry in the process. I highly recommend this title to others. You might be hungry at the end of it, but you'll be ok.
LOL. Fun Review Carrie and now I'm off to see if the library has it! Oh, this sounds fun! I agree with you--book clubs bring titles to my attention that I would never pick up on my own. Some I enjoy, others not so much. I think I might want her job, though. How fun would that be?! Interesting. As you said, this is not a book I would normally pick up, either. I have read a couple of books about chefs (which were way out of my league. I like food but not chef-style gourmet stuff. But I did like the stories.) The disguises part sounds especially fun. I like the way she's cleverly disguised, or rather, concealed, in the cover picture! I don't usually read books about food either, but having read Julie and Julia, and then My Life in France, I am more open to it.